After a close race for the top spot in North America, Universal and DreamWorks’ “How to Train Your Dragon: The Hidden World” pulled ahead to secure the domestic box office crown. The final instalment in the “Dragon” trilogy stayed strong, adding another $30 million in its second weekend of release. The animated adventure is just shy of the $100 million mark in North America with its domestic tally currently sitting at $97.6 million. While “How to Train Your Dragon 3” fended off newcomers to repeat No. 1, Tyler Perry’s “A Madea Family Funeral” still had a solid start of its own. Perry bid a farewell to his long-running Madea character in the 11th and final instalment in the 15-year franchise. It opened ahead of expectations, pocketing $27million from 2 442 theatres. “Madea Family Funeral,” which Perry directs, stars, and produces, marks the end of his partnership with Lionsgate. Like previous “Madea” entries, audiences were more receptive to the eccentric character than critics were. The film nabbed a promising A-Cinema Score, while its Rotten Tomato score is a less-enthusiastic 25%. Moviegoers over the age of 25 accounted for 78% of its opening weekend, while 67% of crowds were female. Third place went to Fox’s “Alita: Battle Angel,” which earned $7 million in its third weekend of release. Warner Bros. “The Lego Movie 2: The Second Part” landed at No. 4 with $6 million, while Universal’s “Green Book” rounded out the top five, amassing $4.7 million after nabbing an Oscar for best picture. 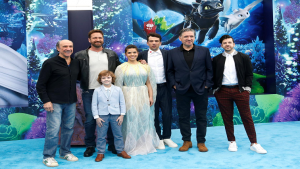 The post How to Train Your Dragon 3′ Stays Victorious’ remains Box Office favourite appeared first on SABC News – Breaking news, special reports, world, business, sport coverage of all South African current events. Africa's news leader..